We first meet Oh Dae-Su (Min-sik Choi) in a police station. He’s drunk, and jump cuts show him behaving badly all evening. He’s almost sober by the time his friend comes to pick him up, but not quite. It’s a bad beginning to one of the worst days of his life. Dae-Su never makes it home that night. He is kidnapped and then held against his will in some sort of strange apartment. It’s not a prison, which is odd, because it means some private individual has created this carpeted one-room hell-hole, with a television and a fake view of the Dutch countryside. He’s fed every day through a little opening, and occasionally the room fills with some sort of knockout gas while his captors change the towels. Narrating from the future, Dae-Su tells us he will be held here for fifteen years, but that after about six years, he will begin his Monte-Cristo-like plan for escape. He will train himself. He will harden his muscles, his knuckles, and his will. He will practice punching the wall until both he and the wall are bruised, and then he will practice some more. Meanwhile, he will slowly, carefully, scrape away at the mortar behind his bed until he’s through to the other side. Then, when he’s out, he will find whoever put him here, and destroy him. This task he begins in his cell by keeping journals. The first journal is dedicated to finding out who might have done this to him. He starts with the names of anyone he ever wronged, one of whom must surely be responsible. I won’t say much more, although the film is only half over when Dae-Su’s fifteen years are up. What director Chan-wook Park and screenwriters Jo-yun Hwang and Chun-hyeong Lim do with the second half is to reframe what we know about Dae-Su in the first half. There is a beautiful symmetry about the story, and within it are more symmetries of character and action. In some ways, Oldboy is Korea’s answer to Hong Kong’s Infernal Affairs, an undercover cop movie with undercover gangsters. 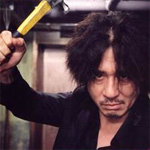 At this point, you may be thinking “yeah, it’s some twist ending, or some he-said, she-said thing; whatever.” But there is no gimmickry in Oldboy What we know about Dae-Su does not suddenly change; his character is constant throughout. Park didn’t withhold any relevant information from us in the beginning, simply for the sake of a twist. Dae-Su is not really a woman, nor is he a ghost. The symmetry of the story is entirely justified by the characters. The scene where we see the symmetry really unfold takes place at a school. Somehow, Park’s location scout found the perfect place. It’s a two-story school with lots of stairs and walkways set at right angles to each other. Photographed (by Jeong-hun Jeong) with a flattening telephoto lens, the school starts to feel like an Escher drawing, which fits the scene and the whole story perfectly. Another scene where sets and photography blend perfectly is a long hallway where Dae-Su has to fight his way past a dozen thugs who are blocking his escape. The entire sequence is shot side-on, like a cutaway view of a mole’s tunnels. The scene plays for long stretches at a time, with characters hitting each other with a hammer, pipes, knives and fists. It’s a brutal scene — Dae-Su keeps fighting even with a knife stuck in his back — but it illustrates the raw, unfairness of Dae-Su’s situation and his dogged determination to get his revenge. The final flourish that really makes Oldboy delicious is that it is unabashedly a tragedy. The closest Hollywood will come to tragedy is something like Memento or Sin City (neither being very “Hollywood” to begin with). These American films don’t have “happy” endings, but they’re not really tragic, either. Oedipus, Lear, and Loman don’t exist there. These worlds are made for macho, gritty film noir protagonists, not shamed, devastated tragic figures. Oldboy is very violent and very bloody. It is not for kids or squeamish adults. Notoriously, critic Rex Reed had a tizzy about some of the film’s more horrific scenes (at least two of which he described incorrectly — perhaps he closed his eyes), one of which shows man eating a live octopus (sorry, PETA). Importantly, the violence is not gratuitous. One could argue the same story could be told with less blood (and for the American remake, it probably will be), but then the film would lose much of its operatic power. A few minor criticisms crossed my mind while watching Oldboy. Occasionally the rich score would become cheesy synthesizer music, and some of the fight choreography seemed a little staged and timid. But on reflection, these do nothing to diminish Oldboy’s dramatic power. Oldboy colored my whole day and threw a dark cloud over the sunny springtime skies. It acted directly on my id, bypassing my ego entirely. All my conscious mind could do in the face of such emotional wrenching was to marvel at the power of film and a well-told story to completely change one’s emotional state.